Laura practices physical therapy at the UW Health Research Park Spine Physical Therapy Clinic. She treats patients with functional limitations due to a variety of orthopedic and spinal conditions and integrates manual and exercise based interventions into a patient centered approach. Laura sees patients upon referral. 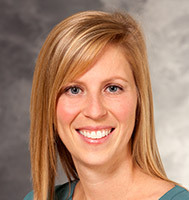 Laura holds a doctor of physical therapy degree from The University of Iowa, Iowa City, IA.